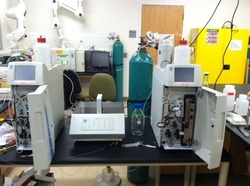 The River Center analytical laboratory has the capacity to analyze water and trace gas samples. The lab is equipped with a high purity DI system (Barnstead Genpure xCAD UV), glassware washing room (acid bath and Miele G7883 washer), large drying oven (5 c.f. Fisher Scientific Isotemp gravity-flow oven), large muffle furnace (1.6 c.f. Thermo Scientific Thermolyne single-setpoint tabletop furnace) balances (Mettler Toledo MS NewClassic and Denver Instruments S-2002) and cold storage room. Dionex ICS 2000 Ion Chromatographs with eluent generator for anion and low molecular weight organic analyses (nitrate, chloride, sulfate, bromide, phosphate, acetate) and cation analysis (calcium, magnesium, sodium, potassium). AS40 autosampler has a simultaneous injection kit. Bay Instruments MIMS with Pfeiffer Vacuum PrismaPlus quadripole mass spectrometer system and copper furnace for direct measurement of dissolved N2, O2, and Ar. Submersible sensors that integrate with Campbell Scientific CR-1000 dataloggers.